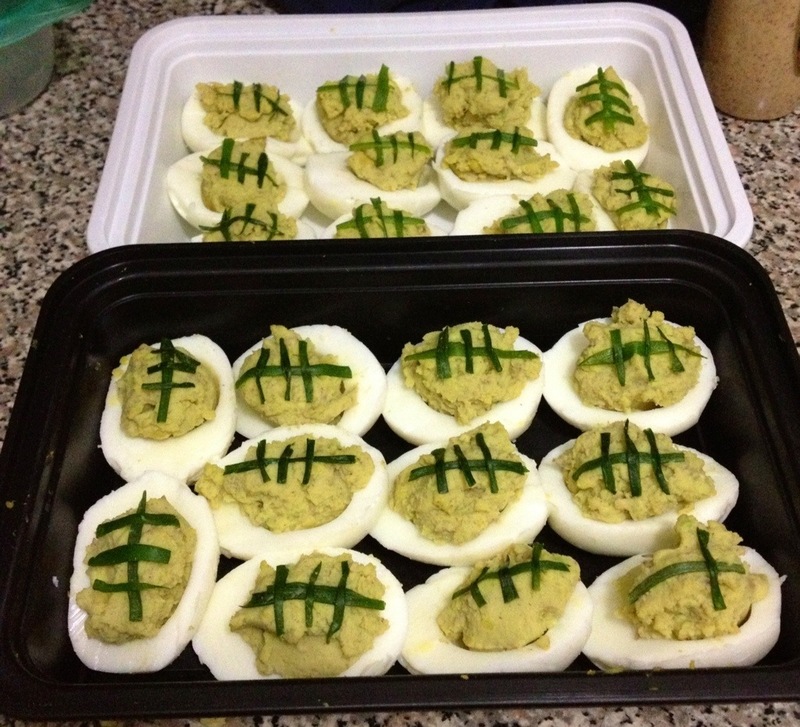 I wanted to make some fun party food in honor of the Super Bowl. I got the idea for these from Cute Foods for Kids – they have 26 different football-shaped food ideas! They used chives to make the laces on theirs, but I had scallions on hand so I used those instead – definitely fussier, but totally worked. I also wanted to make deviled eggs without mayonnaise – I don’t know, sometimes mayo kind of skeeves me out! But all the recipes I found for avocado deviled eggs (avocado being my favorite replacement) still called for mayo. So I decided to wing it. I gathered all the standard ingredients – Dijon mustard, paprika, salt, white vinegar, and most of an avocado. I hard-boiled 12 eggs – put them in a pot with cold water, brought it to a boil, then turned off the heat and left it covered for 10 minutes before cooling them – perfect very time! Then I mixed the yolks with the avocado, a couple generous squirts of mustard, a splash of vinegar, and a sprinkling of paprika and salt. I tasted it and had my roommate taste it until it was perfect – no mayo needed! I filled the egg hollows and arranged the laces – and done! Instant crowd pleaser, and a fun twist on the traditional.